You followed Steve’s advice for how to make a budget. Then you tracked your expenses in EEBA for a month. Or maybe even longer. Great job! So why does it feel like something’s not quite right? Maybe you’ve noticed an Envelope that’s often in the red. You know which one I’m talking about… Or maybe you have an Envelope that always has extra green. No worries. Budgets are a bit like clothes. Sometimes they fit well — and sometimes they don’t. Most budgets need some tailoring before they fit just right. Here’s how you can tailor yours with EEBA. Pull up the Expense vs Budget Report on the web and assess how you’re doing. Is there an Envelope that’s over budget (in red)? Or under budget by a lot (a short blue bar)? Pick just a couple to start. In my household, we were over in Utilities (at 155%! ), and under in Household Items (at only 50%). Get real numbers. With the Envelopes you picked in mind, go to the Expense Breakdown Report. Find out how much you actually spent last month — or your average across a few months. In our case, we averaged $213 per month for Utilities and $62 per month for Household Items. On Edit Budgets, compare your budget amounts with actual spending, then tailor your budget. This may mean simply reallocating money in your budget — or changing your spending. We bumped Utilities up and knocked Household down both by $63, which brought us closer to a realistic budget. As a last sanity check, make sure the total at the bottom still fits within your income — if not, adjust other Envelopes’ budgets or increase your income (side gig, anyone?). Sometimes you’ll need to make a bigger change. This fall we flew out of town for family emergencies. With no good place for those expenses, we recorded them in our Celebrations Envelope leaving it deep in the red. Just to catch up to $0, we’d have to go 8 months without spending a dime! Instead, we made a new Envelope for Family Emergencies. Stuff happens — we don’t know when, but it will — so we’re saving up to be there for our families when they need us. Need to add an Envelope too? Do it on Edit Budgets. In order to see how well your revised budget fits, start fresh. Make Envelope Transfers from extra-full Envelopes to those that are short. If you have a Scheduled Income or Distribution, check to make sure changes to your budget are reflected there too. Now you’re all set to keep using your updated budget! If something’s a bit off, make a few more tweaks next month. Our finances change over time (just like our bodies), so feel free to keep tweaking your budget so it can fit just right! I put in too much in our envelops because I had to take out a deposit (the money not in yet). So I trying make it right. HELP!!!!! I need to start over again. How I do that? You can always edit the incomes you’ve already put in, or simply delete and remake them if that’s easier. To do either, head to your Transactions History page (https://eebacanhelp.com/transactions/history.php) and click on the “edit” link to the right of each transactions. If you want to delete all of your transaction data to completely restart, click on the “My Account” link at the top right of the page, then on the link “clear all my data.” (https://eebacanhelp.com/household/reset-household.php) That will clear all of your transaction data, leaving only your Envelopes and their budget amounts. It would be nice to have budgets for income as well so that EEBA could show a monthly Budgeted Income – Budgeted Expense figure. Otherwise I can’t see any other way to plan monthly income except on a piece of paper to make sure expenses don’t exceed income. Thanks for the feedback! The mobile apps let you put in your estimated income and plan your budget accordingly. We’re working on getting that into the web app as well! is there a way to allocate money into envelopes by percentages rather than actual amounts of money? For example, if every pay check is different and you want to put 20% into groceries, 20% into gas, etc. rather than X amount of money. Currently, no, but if your income is the same month to month you can create a Remembered Refill that distributes your income along those percentages and then re-use it month to month. Hope that helps! Feb 1st want to start new month of tracking…how do you clear January transactions, without losing transactions via transaction history (permanent). Want to compare history month to month. Transactions not cleared automatically on the first of each month. Thanks. It sounds like you want to reset your Envelopes back to full so you can start tracking expenses in February with a clean slate, is that right? 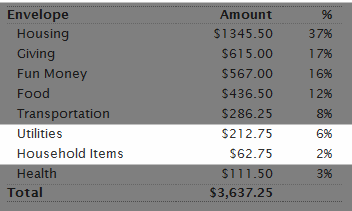 If so, you can head to the Add Money / Receive Income page (https://eebacanhelp.com/transactions/reset-amounts.php) and choose “Set all envelopes to budgeted amount.” That will refill all your Envelopes to full. hello, ok so two of my envelopes have money of lets say 50$ and i usded 25$ of this whey am i in red? other envelopes look the same and this is not happening. a little confusing on this part. Im glad this budget works on PC and iphone products. Very handy. It sounds like the Envelopes weren’t funded. When you create a new Envelope, don’t forget to fill it with money via the Add Money / Receive Income page (https://eebacanhelp.com/transactions/reset-amounts.php), or the Distribute from Unallocated page (https://www.eebacanhelp.com/envelopes/distribute.php).